Children in Giraffe Class (Year 6) gain invaluable experience of working with different teachers, which prepares them for life in secondary school. During the year, we aim to offer the children a broad range of experiences, both in and out of school, and develop their independence and responsibility for their own learning. 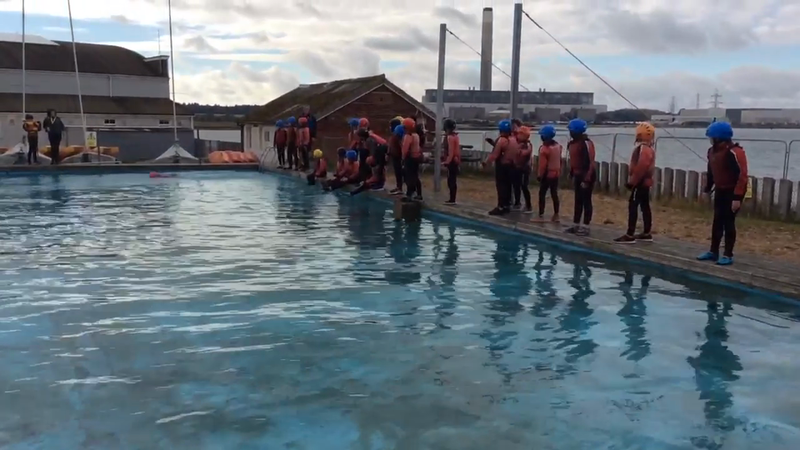 At the start of the year, we visit Calshot Activity Centre for our residential, which builds confidence and develops collaboration skills. Homework Rota: Maths and English homework is handed out on a Wednesday for completion and return by the following Monday. There are also occasional small homework tasks that are set in response to the learning in class. During assessment weeks and holidays children are not given homework to complete but they should use this time to improve their knowledge and recall of multiplication tables (and commutative facts) and to develop a love of reading. Reading: Children have a reading diary in which to log their reading at home. It is widely proven that reading is essential to a child's education and we read in class regularly, but we also ask that children read at least five times a week at home (evidenced in their reading diary) and an adult signs each page of their diary. Diaries are checked each week. P.E. : Games time is Monday afternoon (with R & R) and indoor PE is on a Thursday morning, but we ask that children have PE kit in school at all times. If there is any aspect of your child's school experience that you would like to discuss, please call the school office to arrange a meeting. Some examples of the free-choice Christmas homework created by Giraffe Class. Giraffe Class recently presented an Advent service in St Matthew's Church. They fully embraced the responsibility they were given and worked collaboratively to bring together various elements into an entertaining and informative service. These are just a few of the maths websites that we recommend. Any extra practice that the children can get at home would be really beneficial. Examples of Remembrance inspired mosaic work in art. Rain came to Calshot this morning and the children were worried about being cold and wet. Clearly they hadn’t quite realised that the first activity of the day was raft building and the chances of being cold and wet were already very high before the weather decided to play its part. It was really nice to finally have all of the children back together and enjoying an activity as a whole class. They were brilliant listening to the instructions about knots and how to bind the components of each raft together and they were brilliant working as a team during the races. Some were very vocal when they accidentally slipped a foot into the water (but then it was incredibly cold despite the wetsuits), so it was somewhat surprising that pretty much all of them decided they wanted to jump in at the end. But they thoroughly enjoyed themselves and were fabulous. Later on in the day, the abseil tower once again threatened to be the end of the positivity as group 3 were challenged to take the metal staircase and descend with the power of gravity. There were a few tears and some uncertainty but all of the group made the jump (Miss Robinson made it in a super-quick time!) and were incredibly proud of themselves…so much so that they went again for a second attempt and the change in attitude was really warming to see. Miss Muchmore, Mr Slater and Miss Jones, showed real grit, pushing themselves up a second time despite grave reservations the first time around. There was more snowboarding again today as well, and it was brilliant that the children were given a second chance to build on the first session earlier in the week. They all showed that they could remember the basics and were able to take on more of the challenges of the slopes – there are some tired legs this evening! The final activity for today was the shooting. After a day of energetic activities, it was interesting to see them try to calm things down and take on a precision skill. There were some very high scores in the first two rounds and Mr Marwood hit 3 incredible dead centres…then he admitted to having a telescopic sight on his rifle but the victory was still his. Best wishes from a very proud teacher and the amazing staff who have been supporting our class today: Mrs Compton, Mrs Armstrong, Mr and Mrs Flatman and Mrs Phillips. * Please ask the children if the reference doesn’t quite resonate. Well, day 3 can only be described as a day of ups and downs here at Calshot. We started the morning watching the sun come up, Mrs Phillips came down for a couple of days, and along with the tide (fact of the day: there are two high tides here! ), there were children going higher up the climbing wall than earlier in the week…and then abseiling down; there were snowboarders running up and gliding gracefully down the slope (when I say ‘gracefully’ you know I’m being polite of course!) and there were pairs being pulled up to the roof by their classmates in the team swing - and then swinging VERY QUICKLY to the ground. The faces of the children coming down the swing were priceless. If your child was in group 3, just ask for an example of Livvy’s face, Thomas’ face or Mia’s face. We had great fun and the children worked brilliantly as a team. Their leader Jacob finished with a little pep talk and had this to say: “That was such a lovely session. You were all so supportive of each other.” I would have to agree. In the cycling skills session there were a few small falls but all of the children soon managed to get to grips (pun intended) with the difficult fixed wheel bikes and the cleats. Again the team work was tremendous as the children helped each to stop the bikes safely. We were also out and about a lot today as we visited the beach to collect shells, seaweed and other items to once again create incredible artwork. Some of it really was quite good and the children fully engaged in the simple task of looking around the local shoreline. They also had the opportunity to see more of the grounds of Calshot as they completed an orienteering activity in pairs. They followed instructions to seek out the wayfinder signs and collect the letters to prove they had been successful. It is clear that the children are fighting back the exhaustion and the adrenaline is also taking its toll on many of them but once again they have been incredible in the way they have taken on their personal challenges and pushed themselves in every activity. Young Miss Lane was phenomenal on the climbing wall, choosing to go one step further on her first attempt (3 blocks high) and then reaching the very top (some 7 blocks up) on her next. Her face was a picture of pride. During the climbing, Mr Essex seemed quite at home resting at one of the highest points of the climbing wall whilst having a good look around the centre. But, for me, Mr Coutts was my greatest source of pride today as he fought off his nervousness on the team swing and asked me to go on with him. He went higher than he intended but then wasn’t happy with just the one go…and on the second time up he went even further. He was brilliant. But then they all are. We are having a great week here and your children continue to impress us with their ability to pull together and show support to each other. Amongst everything else, we have seen a great deal of resilience today. Best but slightly tired wishes from all at Calshot. A pleasant surprise awaited the adults this morning as all of the children worked hard in order to receive the award for the tidiest accommodation and every room looked well cared for and very homely. The boys’ competition was a close run contest (which may surprise many of the parents back home!) and the girl’s competition could only fairly be given as a draw. Our classroom mascot now sits proudly in the end window of their corridor…along with a few companion cuddlies. Almost all of the children started the day with a shower too…so if they complain in the future, just remind them of their week away! Today has been a really long day and as I write this half of your children are running around following instructions in the orienteering, and the other half are running up (and sliding down) the ski slope in the ring-o races which include Mrs Simpson, who has given up her time to join the children for some of the day. It’s fair to say that sleep should come easy for your children tonight. For most of the children, today included abseiling. This is generally considered to be the most challenging activity as it starts from a very high platform amongst the rafters of the hanger and ends with the children suspended in mid-air – safely of course – descending at their own pace to the ground below. Everyone pushed themselves to the edge and most went over, but the important thing is that all of the children recognised that they had gone further than they first thought and once again we are very proud of them. Young Mr Stockley finished his descent with my personal quote-of-the-day: “I feel really sad but really happy too and I think I just want to cry.” This was followed by wonderful tears of joy and pride which the whole group embraced. In Mrs Compton’s group, Mr Mack showed everyone a truly caring side as he helped Mrs Compton to challenge herself to reach the edge of the abseil tower – it’s not just about the children here you know! During today’s beach-combing the children made a group octopus out of everything they could scavenge. It was a ‘beautiful octopus’ competition but on this occasion the word ‘beautiful’ should be used subjectively! The weather has turned bitter today so Mrs Armstrong’s group not only braved the beach but also the outdoor initiative course and once again all of the children pushed themselves through the tunnel…or helped each other to succeed. The ‘Team Giraffe’ spirit is strong here at Calshot but once again thoughts of home are not far from our minds and I’ve been asked if I can read a story tonight…which I am only too happy to do. Best wishes from all of us at the seaside. There is nothing quite like a residential to make you remember why teaching is such a great profession. We have only been here half a day and already we have had tears of joy as children have pushed themselves to overcome fears of the dark and of heights…and a few tears from those missing home sadly. The first activity of the day was the initiative course and the groups soon realised that the only way to complete their challenges successfully was to pull together and work as a team. Collaboration was the key and the teams worked well to achieve their goals – whether it was to survive in shark infested waters or retrieve lost keys in the rope maze. During the second session, the climbing wall witnessed many personal achievements and all of the children went further than they set as a target or even reached the top. The abseiling was somewhat questionable though with quite a few crash landings…but smiles of pride were evident across all of the children’s faces and we couldn’t have been more proud of them all. The food and lodgings have lived up to all expectations and the children are well fed and watered and already looking forward to day two. Your children have been great fun to be with and incredibly supportive of each other…and the week has only just started. We think that we can confidently say that the word of the day is AWESOME and the children are having fun. But we are sure that they are missing you all. Mr Geraghty, Mrs Compton and Mrs Armstrong. Please note that all entries below this section are an archive. Useful information to support children in their SATs 2019 will be added overtime. In the meantime, please do let me know if you would like information or further help to support your child at home. National Curriculum Spelling Lists Please note that this information covers all spelling lists across KS1 and KS2. The spelling lists for KS2 can be found towards the rear of the document.